I have been sponsoring children for quite a few years now and I really like what Compassion International is doing. But for the most part the children that I sponsored were a picture that I looked at and a letter that I received a few times a year and prayed for sometimes, and then went back to my everyday life. I’m guessing that’s the way it is for a lot of people who sponsor a child. 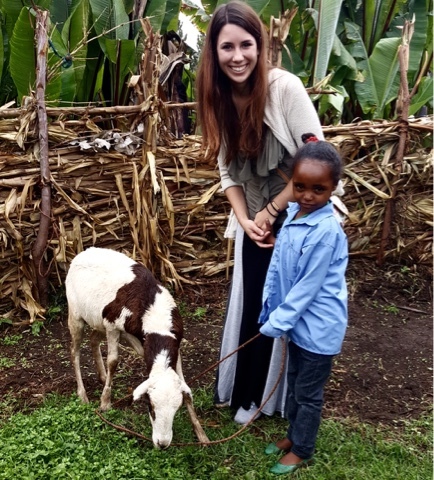 Recently I have gotten more passionate and involved with Compassion so I jumped at the chance to have the opportunity to meet my child, Ruzeya, from Ethiopia, to see what the Compassion Projects actually looks like, and to see what difference my sponsorship is making. With the current situation in Ethiopia I was not sure if I would have the opportunity to meet her. But by the grace of God, I found myself traveling to meet her on Thursday. It’s honestly hard to put into words what I experienced, but I will do my best. 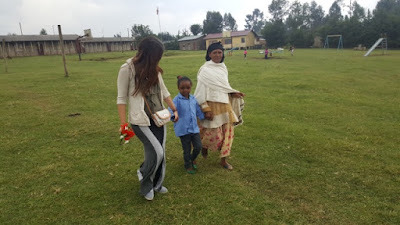 We first arrived to the Compassion Project where Ruzeya attends. 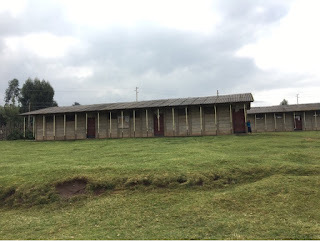 Obviously not all projects are the same, but this project is blessed to have a lot of land with offices, the church, the project classrooms, and a school located on the grounds. There was also playground equipment and this project has a school for KG1 and 2 (prek and kindergarten), this is for children who are both Compassion Children and other children who live in the community to get a head start on their education and have better opportunities. I had a tour of the office, the church, and learned more about what the children do at the project and how all Compassion children attend Sunday school on Sundays, as well. After the tour, they took me back to the multi-purpose room where a group of students were gathered to sing to me a Welcome song. Ruzeya was at the front holding some pretty red flowers. At the end of the song she brought them to me and then hugged me. It was hard for me not to cry. Then the other children left and Ruzeya’s grandmother arrived to meet me. She hugged me for so long with tears in her eyes and I began to realize how much I mean to her whole family. The Compassion workers who weren’t with the children, the Pastor, and his family joined us for coffee and popcorn. Even though they have so little, I felt like I was treated like royalty. The told me a lot about the project and Ruzeya would sit shyly smiling at me. But she didn’t say a word. Eventually I asked to go outside and they warned me that all of the children would rush over to me; which if you know me at all, you know that is something I would totally be fine with. Hand and hand Ruzeya and I walked outside, and sure enough the majority of the children rushed off the playground and surrounded us (probably 60-80 children). They hugged me, shook my hand, touched my hair, and some of them even fought over me. Not once did they push Ruzeya though, they knew that we belonged together. I was overwhelmed and wished I could take every single one of them into my arms. After a little while the Compassion workers, Abraham, myself, and Ruzeya and her grandmother headed off towards her home. The area where she lives is not currently being effected by the drought, especially thanks to rainy season and it actually rained the night before I arrived. We took the little taxis that are typical to the area but because of the rain the ground was muddy and we kept getting stuck. 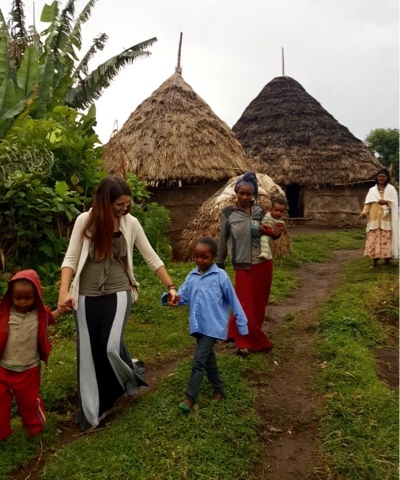 We walked part of the way and I learned that Ruzeya made the 25/30 minute walk to the project each day with just the other young children who attend school with her. 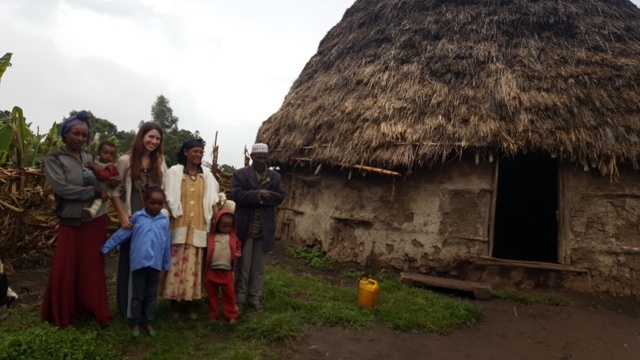 Upon arriving to her home I met her mother, two little sisters, and her grandfather. She lives in a mud hut with her father, mother, and sisters, while her Grandmother and Grandfather live in the hut next door with her four aunts and Uncles who are still in school. They invited me into the little hut which had mud walls covered by newspaper, a grass floor, and two mattresses covered in thin blankets. They told me about how her father works a patch of land and her mother walks into town each day to clean. Ruzeya’s grandmother looks after Ruzeya’s little sisters and takes care of the family. As I talked to them and saw them interacting together I could feel my love for this family grow as if they were my own. blood family. 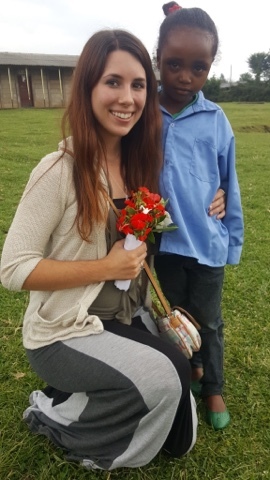 Even though Ruzeya had hardly said a word, her mother told us that the previous day all day long she kept saying, “Do you know who is coming to visit me tomorrow?” I began to see just how important I was to this beautiful little girl and her family. I had the opportunity to bring her gifts and I brought her a backpack with some things including a blanket and a stuffed animal. 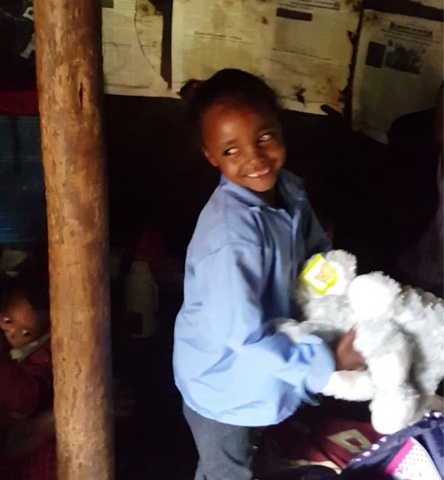 The happiest moment of my life may be the smile that the little stuffed elephant brought to Ruzeya’s face. They even gave ME a gift of a traditional bone spoon with beads on the end! Before I left they took me outside to show me the goat that they were able to buy through my sponsorship. There were many hugs and kisses and I struggled not to cry as I said goodbye to each one of them. Ruzeya and her little sister held my hands and walked me down to the entrance of their land. As I walked away the tears began to flow and even though I already had loved Ruzeya, she was no longer a picture on a piece of paper, but a piece of my heart. In fact, every single member of her family has now stolen a piece of my heart. I was really impressed by what I saw through my visit . 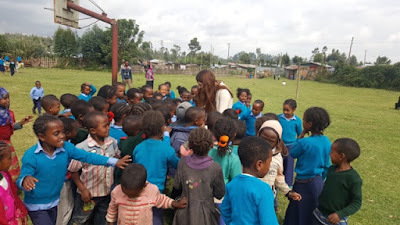 I am only one person, but the 260 children who are being sponsored in that project each have one person behind them that God is using to change lives. A lot of the families in that community are Muslim (including Ruzeya’s), so for some of them, Compassion is the one opportunity they have to learn about God. 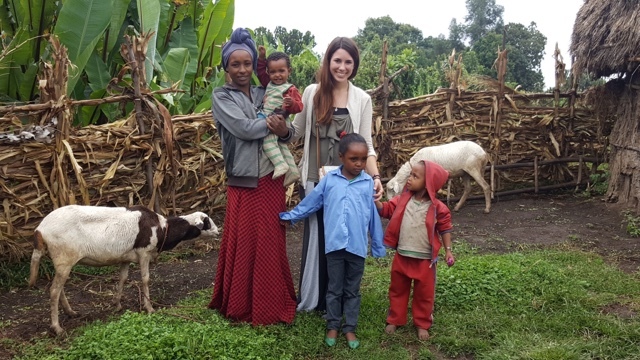 The opportunity that I had to provide Ruzeya’s family with a goat can help to positively impact their financial future not just now, but also longterm. The tutoring, medical care, and other basic needs that Compassion provides on top discipleship aren’t just meeting short term needs, but impacting the future and the ETERNITIES of those children. I have now seen with my own eyes that Compassion is not an organization that merely gives a child a fish (feed them for a day), but it teaches them how to fish (feed them for a lifetime). What is happening cannot only transform the life of the child in the program, but also of the family, generations, of that family to come, entire communities, and the future of that community. By giving these families and children hope, Compassion is allowing the “least of these” to come into the Kingdom of God. And when that child (Ruzeya and others), is no longer just a picture on a piece of paper, but a part of my or your heart, thats when the possibilities become endless!